In today’s world, there is no difference between marketing a global brand and marketing a brand, globally. Think about it. The research, which brought together six of the brightest minds in marketing today, focused on these six key elements that CMOs need to focus on. Global brand leaders have to infuse their team with a cohesive culture that connects and transcends geographic differences. It’s this culture that is the driving force for so many potential successes the organization can achieve. While many people talk about culture as if it is some fluffy concept, it is, in fact, a necessary ingredient for a global organization. Great Places to Work noted that it helps attract the necessary talent that can propel the organization forward on both the local level and on a global scale. When you want to go to market with your product or service and begin to share content on your website, as well as collect information from your audience, your business immediately becomes responsible for adhering to the privacy laws related to the personal information of those in your audience. However, most companies do not necessarily put much thought into the legal ramifications of vague legal notices, like terms of service and privacy policies, listed on their site. It may not seem like it really matters, but it actually really does, no matter the size of your business. A 1999 (yes, 1999) Harvard Business Review article entitled “The Lure of the Global Brand” described numerous challenges related to creating and sourcing a global brand. It noted that economies of scale might prove to be elusive, and that it could be cheaper to just provide resources on a local level to create ads and messaging for the branding efforts. Another challenge was forming a global brand team, which would require a significant amount of resources in order to collect and understand all the information on each market and then execute on the specific needs of these markets. In order to overcome these challenges, it’s imperative to use a model that has a person or group in charge of the brand and brand strategy plan. This person or group must create a clear plan for execution and management of that brand on a global and local basis. A high degree of brand consistency in terms of what they promise and actually deliver. A meaningful difference that sets them apart and offers the type of value that customer can relate to. Consistent brand equity measurement that establishes return on investment for its ability to deliver top-of-mind awareness, an overall opinion, attractive brand image attributes, and perceptions of product/service performance. Despite having excellent strategies for developing a global brand, great challenges still exist for these companies. However, they have been able to recognize those challenges and fight through them to build a transparent global brand image. 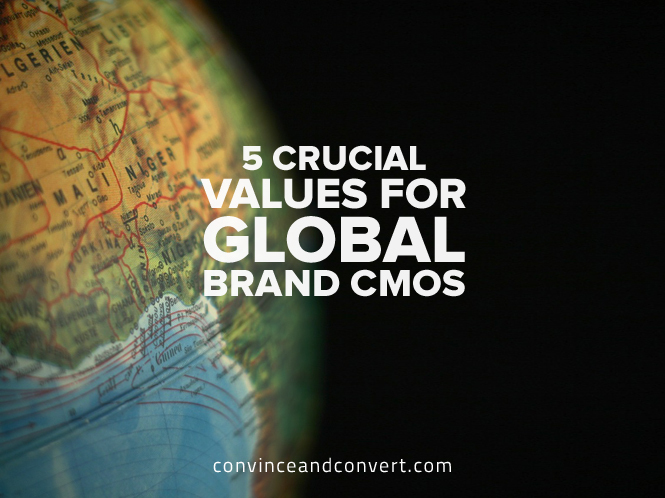 Needless to say, there are a great number of aspects that a CMO must deal with when it comes to marketing a brand globally. As previously stated, there is no difference between marketing a global brand and marketing a brand, globally. Every brand is truly global now, thanks to the internet. That’s why there is an enormous amount of complexity to marketing that a CMO needs to address. This post is part of a paid sponsorship between Oracle Marketing Cloud and Convince & Convert.